The two largest birds in the world are the emu and the ostrich. Both are flightless birds but they compensate by being fast runners. Emus and ostriches somewhat resemble each other as they are both big, feathery birds with long necks and legs. So how then can we tell these two birds apart? Read on and we’ll discuss the differences between them. The emu is the second largest bird in the world. This bird is native to Australia. Both male and female emu have deep brown feathers. They have long necks, very strong legs and have three toes. Emus are fast runners and can run up to 30 mph. These birds live up to 10 to 20 years. When mating, a male and female emu pair up. The females lay greenish-blue eggs weighing around 1 pound each. After laying the eggs, the female passes on the responsibility to the males. The male emu is the one in charge of incubating the eggs and taking care of the chicks. Emus are known for the oil that they produce, which is taken from their fat. This oil is noted to be effective in reducing inflammation and healing wounds and muscle aches. Emus are also farmed for their meat and leather. The ostrich is the largest bird in the world. This bird is native to Africa. The male ostrich has black feathers with white wing tips. The females have grayish-brown feathers. They have long necks, extremely strong legs, and two toes. Ostriches can run up to 40 mph. They also have very large eyes. Ostriches are the ratite (meaning large, flightless birds) relative of the emu. An ostrich can live up to 40 to 50 years. When mating, a male ostrich forms a group and mates with 6 to 7 females. Female ostriches lay large white eggs weighing around 3 pounds each. The most dominant female and the male take turns in the incubation of the eggs. The female is in charge during the day since its feathers adapt to the environment at daytime. The male, on the other hand, is on duty at night using its black feathers as an effective camouflage. Ostriches are farmed mainly for their feathers. These are used as dusters and for decorative purposes. Ostriches are also raised for their meat and leather. What is the difference between an emu and an ostrich? Emus are the second largest birds in the world, while ostriches are the first. Emus are native to Australia while ostriches are native to Africa. Both male and female emus have deep brown feathers. 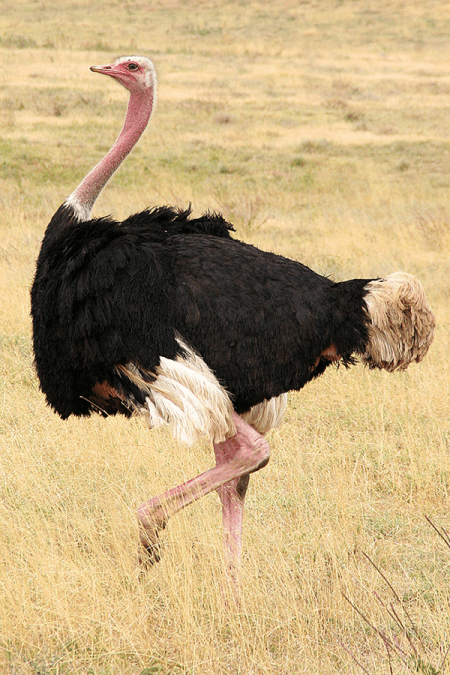 Male ostriches have black and white feathers while the females have grayish-brown feathers. 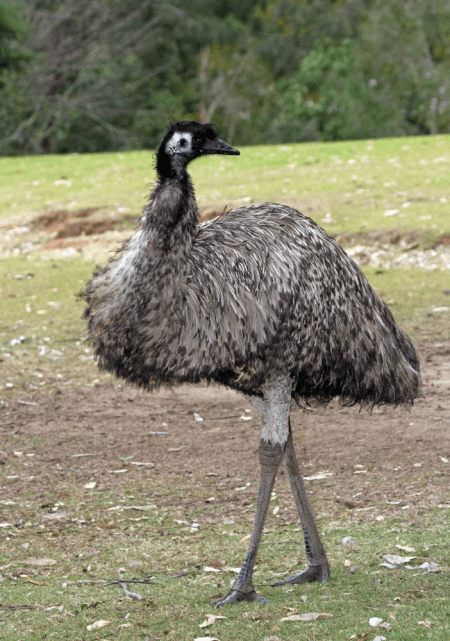 Both birds have strong legs but the emu has three toes and can run up to 30 mph compared to the ostrich which has two toes and runs up to 40 mph. During mating season, only a pair of male and female emus bond together. One male ostrich, however, mates with 6 to 7 females. The male emu is the one in charge of the incubation and caring for the chicks. The ostriches, on the other hand, have shared responsibilities between the male and the most dominant female. The female’s duty is at daytime and the male sits on the eggs at night. Both the emu and the ostrich are farmed for their meat and leather. However, the emu is also farmed for its oil and the ostrich for its feathers.